As a dietary supplement consume 1 serving with 6-8 ounces of water or milk post-exercise. Advanced users may consume 2 servings with 12-16 ounces of water or milk post-exercise. Nutri-Whey™ can be used in between meals but should not be used to replace a meal. Consult your healthcare provider prior to use if you are pregnant, nursing, taking any medication or have any medical conditions. California Proposition 65 WARNING: This product contains a chemical known to the State of California to cause cancer, birth defects, or other reproductive harm. NOTICE: Use this product as a food supplement only. Do not use for weight reduction. NutriWhey™ contains ingredients derived from milk (whey protein). Dark Chocolate Curls, Sucrose, Cocoa, Natural Flavors and Stevia. Whey Protein Concentrate, Sucrose, Natural flavor, Columbian Freeze Dried Coffee, Stevia and Sodium Chloride. Whey Protein Concentrate, Dark Chocolate Curls (Sugar, Chocolate liquor, cocoa butter, butter oil, lecithin & Vanilla), Sucrose, Cocoa, Natural Flavors, Stevia and Sodium Chloride. 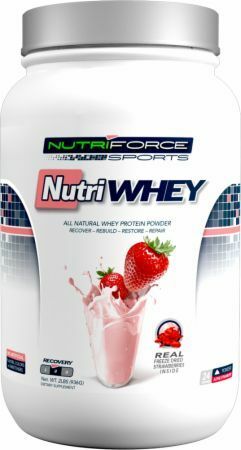 Whey Protein Concentrate, White Chocolate Curls (Sugar, Chocolate liquor, cocoa butter, butter oil, lecithin & Vanilla), Sucrose, Natural Flavors, Stevia and Sodium Chloride. To recover you must rebuild. To rebuild you must restore what was lost. In order to restore you must repair the damage that was done.